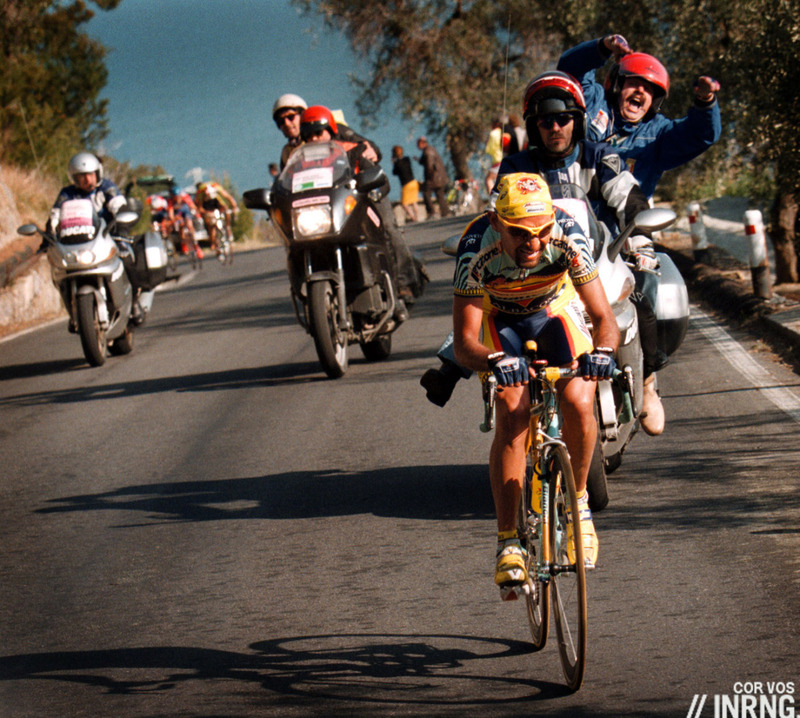 Part of Milan-Sanremo’s ultimate double-act, the Cipressa could be seen as inconsequential climb for the way no rider has managed to launch a winning move here for 20 years. However compared to the Poggio it is much the harder of the two climbs and if it doesn’t pick the winner, it makes for plenty of losers who must race for over six and and half hours only to see their hopes vanish on these slopes. What’s it like to ride on an ordinary day? The Route: The climb starts at sea level in San Lorenzo al Mare in Liguria, Italy. It is 5.6km long at an average gradient of 4.1%. Follow the road and the signs to the village of Costarainera and then Cipressa. The Feel: the Via Aurelia is the old Roman name for the coastal road. 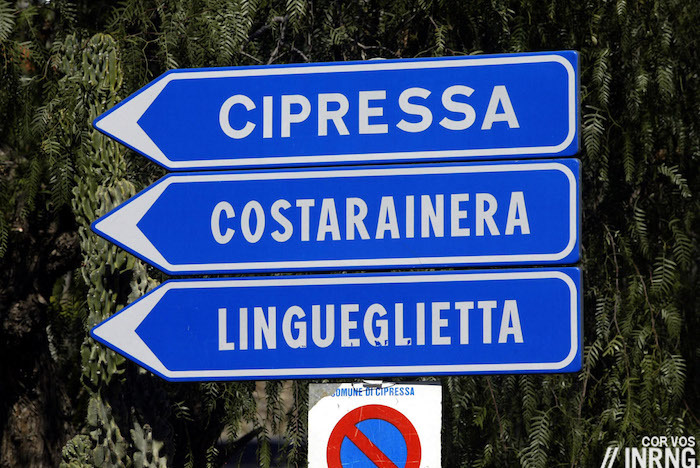 Many roads head inland making it hard to know the right one but if you want the Cipressa it’s easy. Once in San Lorenzo Al Mare just look for the pink buildings as they mark the start of the road and if it’s not obvious enough you’ll see signs for Costarainera and Cipressa. You’re quickly funnelled into a small road. Never climb this road at the end of a long ride on a Sunday as the aromas from the kitchens along the way are cruelly tempting. It only takes a couple of hundred metres before the gradient bites as the road starts winding through olive groves, the region’s cash crop. Some, normally locals, say Ligurian olive oil is Italy’s best. After 1.6km there’s a hairpin bend and the road runs parallel to the autostrada – drive on it here and the tunnels are called Cipressa and Poggio – and so far, so good, the road is flatteringly easy, uphill yet fast and if you rode it in a big group you could almost float up. Almost. At 2.4km under a row of pine trees there’s a very tight hairpin, the kind you want to use the full width of the road and normally you can, this is a quiet road. In the race this lines out the riders, stretching the stragglers. It’s from here that the gradient picks up and you get a slope of 6-7%, the road surface is worse and if the wind is blowing it’s more exposed. 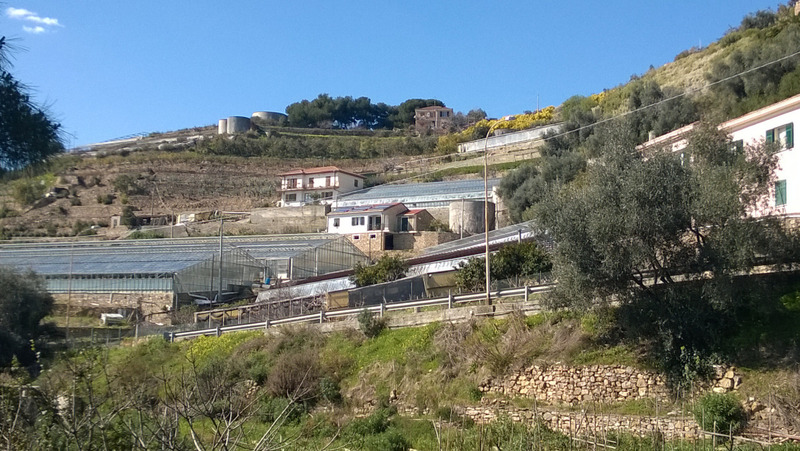 In the space of 5-10 minutes you’ve gone from the coast with its beaches, ice cream sellers and sunglasses stores to small farms where workers in jeans dirtied by soil and two stroke engine oil toil among the plant nurseries and olive groves on the terraced slopes. Look for the bell tower on the ridge up above, that’s Costarainera and where you’re heading. There are more olive trees and the road is littered with black dots from where the fruit has been squashed on the road to leave an oily residue. Cipressa? Given the lack of cypress trees perhaps Oliva would be a better name? After 4km you’re in Costarainera and on a balcony road that runs below the village with views of the Mediterranean sea below and the gradient has eased up. It’s fast across the top here and you ride across the village of Cipressa. There’s a pinch point as you ride past the church then you pass the village square and suddenly the descent begins, the road tips downwards. The Cipressa’s descent is the Via Avvocato Michele Fossa. The road is named after a lawyer. I don’t who he was, perhaps he made a living defending people who crashed on the way down? In 1984 Dutchman Jan Raas made a mistake and fell over a barrier. 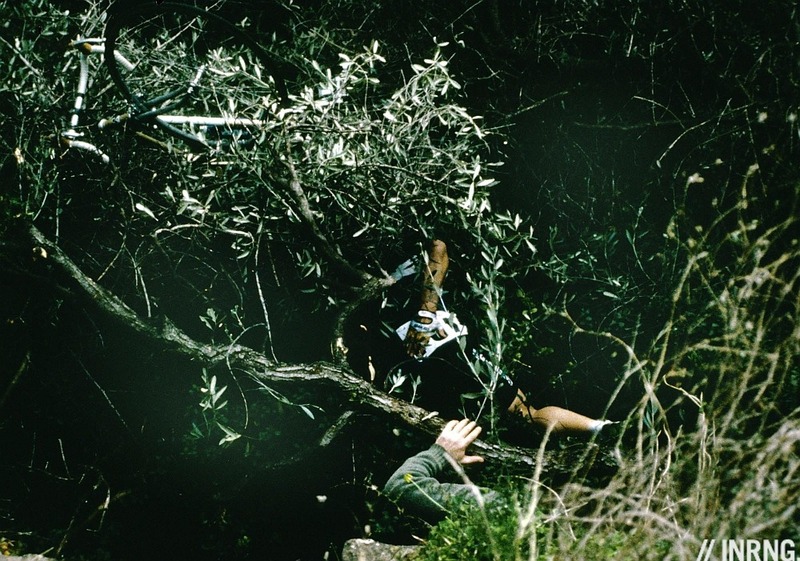 They found him hanging in an olive tree below. It starts fast and there’s a tight hairpin bend in no time, a safety stop to remind you not to let rip. The descent is a toboggan run, steep and with twist and turns that reward some local knowledge. You can fly through some corners in the same way a Super-G skier can take a course but there’s little margin for error, get one bend wrong and you’ll set up the next out of position and if you don’t brake you’ll crash. There’s often no place to run off here, it’s either a concrete wall, a steel barrier, or a drop into a field below. Play it safe and you can enjoy the views, the sea looks better from the hills than it does on the beach and you can measure how for you’ve got to go on the descent by seeing how far below the sea is and in no time you’re in Aregai. Turn right and follow the coastal road for the Poggio. The Verdict: a proper climb with 4km at 6% to Costarainera and then a flatter balcony section across to Cipressa. It’s worth doing for the views and Cipressa is a charming village. It’s wilder than the Poggio with open terrain and fewer buildings. If it’s too far from the finish to launch a winning attack that’s because of the 9km flat section from Aregai to the start of the Poggio as any climber capable of taking time up this climb will flounder on the flat. The main use in the race is to eliminate riders and increase tension. One thing the TV rarely gets is the descent and just how wild this is, it is far more difficult to negotiate than the predictable Poggio descent. Race History: Milan-Sanremo is an ever-changing race with only Milan and Sanremo for fixtures. It began as a two day event but switched to a single day race a year later. It continued unchanged until, fed up with Belgians winning the sprint in the 1950s, the race organisers added the Poggio in 1960. In time this wasn’t enough so the Cipressa was added in 1982. Ironically a foreigner won again as the unheralded Marc Gomez of France took the race after a long breakaway. Since then the climb has been a staple of the race and if it rarely provides the winner it picks plenty of losers. The last successful attack on this climb that stayed away was Gabriele Colombo in 1996. It recent years it’s been the launchpad of vainglorious moves, whether Marco Pantani in 1999, Michele Scarponi in 2011 or Vincenzo Nibali in 2014. None of these moves led to victory but what else could these climbers do? They had a communion with the RAI audience and attacks here are decisive in ejecting the sprinters. As seen on TV: often the action is not about who is attacking but who is being dropped. The TV camera behind the bunch is as important as the one in front covering the attacks. This is its essential role, it eliminates many riders to ensure only the best go on to the Poggio. Without the Cipressa the Poggio would be boring. Travel and Access: it’s in Italy but just over the border in France Nice airport offers many transport links. Otherwise the area is well served by the A10 Autostrada and rail links to Genova and Milan. Few will visit for the Cipressa but in the space of a week you can see the Poggio, the Col de la Madone, the Turini, the Madone d’Utelle and many of the training roads used by the Monaco-based pros, the week in between Paris-Nice and Milan-Sanremo is a good time with quiet roads and spring weather. An excellent description. This longish climb is always second in the series where riders without the ‘legs’ say their farewell. Especially if teams are riding hard on the front in an effort to dislodge sprinters. The descent, a little like the Poggio, is underestimated in my opinion in its difficulty especially if the roads are wet, coming so close to the end of the race when Adrenalin levels are high. Agreed! I´ve ride this once and the decent from Cipressa is far more brutal than what it looks like on TV. Thanks Inner Ring, nice to have some context before tuning in. There’s plenty of footage on good ol’ youtube. The inner line looks like the one to take on the way down; wouldn’t fancy doing that in the wet. Great write up!! Anyone heading there might set up camp in Sanremo and then ride the bike trail (the same one they used last year for the chronosquadra) down to the start of Cipressa, then follow the race route back to Sanremo, as we did awhile back. Note on the smashed olives on the road – I believe that’s only in the fall when the olives are ripe enough to fall from the trees or out of the trucks hauling them around, we’ve been there in March and June with zero issues relating to slippery pavement. Thanks for the interesting description. Really neat to learn the intricacies of this climb. Hope to check it out in person one day! A lovely read and some beautiful pictures – can almost feel the sun from my grey office desk. Thank you! I rode this with my brothers about 5 or 6 years ago. When the tour started in Monaco we stayed on the Italian side between the capi…maybe about 40km from Sanremo and 60 from Monaco. Riding the last section of a renown classic on the way to watch the tour was a bit weird but actually the best memories of the day are riding the Poggio and Cipressa (and how fast Canc was going compared to Menchov and how still Wiggo’s upper body was). Every year since I can send a text to my bro about 3/4 of the way up cipressa reminding him of the (one) time I dropped him. Tomorrow we’ll be watching together. But the buzz you get from riding the roads of pro cycling lasts for as long as the pros keep riding them. Ahh the night before a big classic when we all feel like kids on Christmas eve again. I love that picture of Pantani attacking. If the guy in the blue jacket on the back of the motorbike had a job to do he seems to have forgot about it for the moment! You have to admire Italian passion. I hope someone good has a go on the Cipressa today, Nibali or Thomas maybe. It won’t stick but it all adds to the mix.